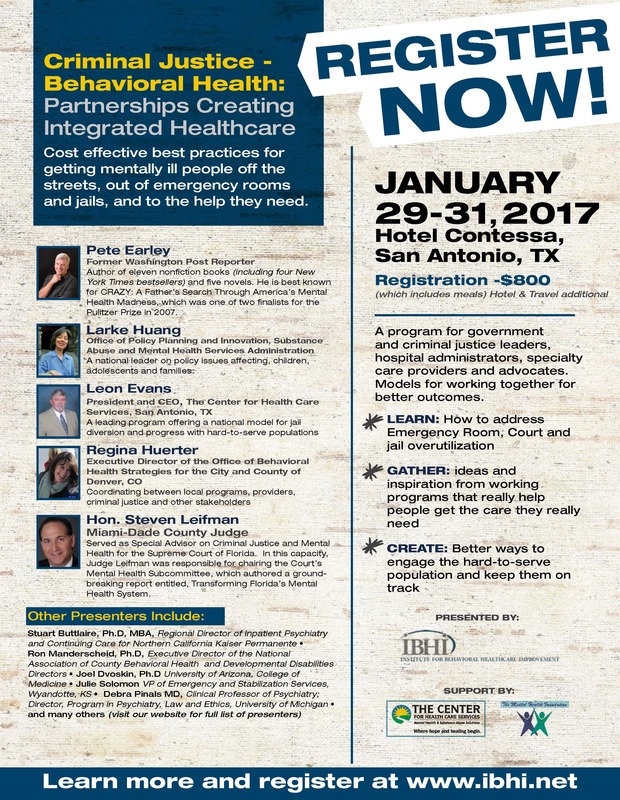 Criminal Justice and Behavioral Health Event in San Antonio, Texas! In the News: San Antonio community mental health efforts gain national attention, and these best practices will be highlighted at the upcoming conference. As individuals and communities across the country struggle with the challenges of addressing mental health challenges, San Antonio's efforts have gained recognition as a national model. Their progress was recently profiled in The Boston Globe and will be they will be the host city and centerpiece of an upcoming program presented by the Institute for Behavioral Healthcare Improvements with support from the Mental Health Foundation and Center for Health Care Services. Learn more below and on the IBHI website. Click here to download the e-vite to send to your colleagues and community.